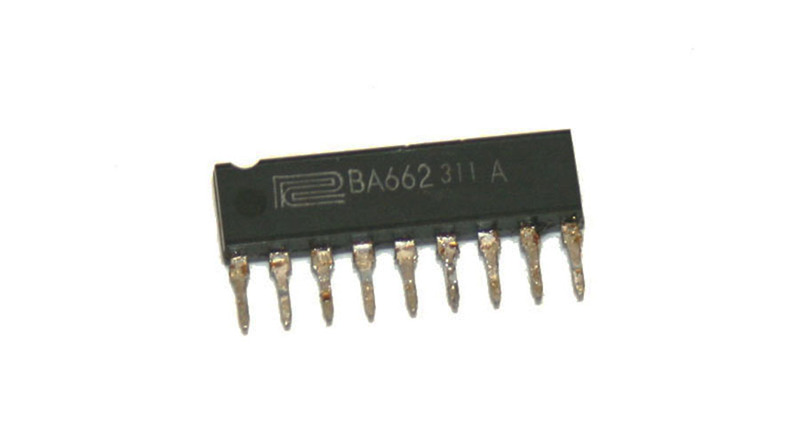 The Roland BA662A VCA chip is the Voltage Control Amplifier IC from the Roland SH-101, TB-303, Juno-60, JX-3P etc. which is a part of what makes it sound so wonderful. These can also be found in the Jupiter-4, the Jupiter-8, and MKS-30,50 and 80. They have counterparts – The Roland BA662B (B stock versions of the A) and also a cousin IC the BA6110 which is similar, and looks virtually identical under a scope, but the power comes from negative rather than positive, and so it won’t work exactly the same way. I found one (count it, 1…) here and I got really excited, but typically for whatever reason yahoo email servers reject my email address and it goes into the junk, and people never see the messages*. * edit: he wrote back to me, and he has one! Additionally while I would never ever encourage anyone to take apart of piece of working equipment to salvage parts there is a wonderful little foot pedal from the 80’s called the Boss HC-2 which actually has 2 (count ’em 1, 2…) of the Roland BA662A IC chips in them and since that’s such a silly foot pedal I wouldn’t feel too badly about cannibalizing it. I’m attempting to UN-mod my beloved SH-101 and restore her to her glorious full working factory specifications. It feels like very important work. Someone in the 80’s decided to add some modifications to create an audio input to the filter, and some envelope adjustments to the synth, and as the result actually removed the BA662A chip from the instrument. They replaced the original chip with a CA 3080 IC – a chip about half the size – and then spiderwebbed the inside of the synthesizer with wires to connect a series of pots and input jacks to allow for these modifications. I am un-soldering, and removing all of these modifications and attempting with the help of Kevin Siegenthaler (my synth guru) to restore this beloved piece of equipment to her stock functionality, and perfect sonic magnificence. Check out the other things they offer – like a 303 mother board, all built and beautiful, for $75! Syntaur is a company in Texas who seem to repair, service, and salvage all things analog. They are well documented and carry many things.